Welcome to the website for the Mystic Flag Committee, which has oversight of Mystic’s historical Liberty Pole and Liberty Pole Square. We also oversee the placement of the American flag along the sidewalks of Mystic on major holidays, with the faithful assistance of Boy Scout Troop 76. Our tall flag pole, located at the junction of Route 1 and Holmes Street in downtown Mystic, has proudly flown the Stars and Stripes over the Mystic River since 1862. 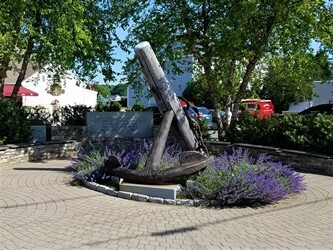 Liberty Pole Square is a small park, located next to the S & P Oyster House, which features a historical anchor from a lumber schooner which sank off Cape Cod in 1897. You can learn more about the history of our Liberty Pole and Liberty Pole Square here. Or better still, read a great deal more in our booklet, Mystic’s Liberty Pole: 1862-2012. All proceeds from booklet sales go to the maintenance of the Liberty Pole, Liberty Pole Square, and sidewalk flags. 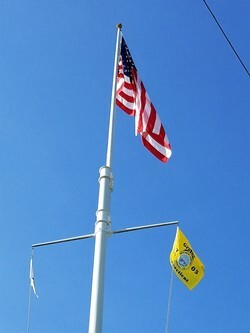 The Mystic Flag Committee is a non-profit organization, and all donations are tax deductible. Please consider making a small donation to keep the flag flying over Mystic!